The Vikings were Scandinavian raiders of the 8th to 11th centuries. Swedes, Danes, and Norwegians all came down from the cold north and plundered Europe. For almost 300 years they terrorized the world. The above is the time of the Viking Age, but what many don't realize is that many of the famous Viking heroes were actually pre-Viking Age. This history will cover many of these legendary heroes as well as important dates during the Viking Age. A.D. 436, This is the time of the legendary Sigurd the dragon slayer. Son of hero Sigmund and leading figure in the Volsung saga. Also known as Siegfried. 480, King Hadding of Denmark. Raised by giants he fought many a great battle. His tale is filled with fantastic creatures and magic. 520, Beowulf. Perhaps the most well known of the Viking heroes. Known mostly for killing the wicked Grendel. 550, Hrolf Kraki. Hrolf is another legendary King of Denmark. His tale is filled with berserkers, witches and all manner of creatures. 793, on the eighth day of June the Vikings sacked the monastery of Lindisfarne on the east coast of England. This was the beginning of the Viking Age. The scholar Alcuin said, "Never before has such a terror appeared in Britain." 793-795, Norwegian Vikings attacked the monasteries of Jarrow, Monkwearmouth, Rechru, St. Patrick, and St. Columbia, sacking them with incredible speed and efficiency. 795, the Vikings sacked the Irish monastic foundation on Iona. They attacked again in 801, and once more in 806, slaughering 68 monks. The survivors fled to the Irish mainland. 799, Aquitaine is raided by Vikings. 800, coastal defenses are organized by Charlemagne. 810, Frisia is ravaged by the Danish king Godfred. 815, Floki of Rogaland set out from the Faergoe Isles and discovered Iceland. 822-823, Archbishop Ebo of Rheims undertakes a mission to Denmark. 832, Vikings raid Armagh in Ireland three times in one month. 835, The Oseberg ship burial in Norway. 837, 60 Viking longships entered the mouth of the Boyne and another 60 sailed up to Liffey. The Vikings devestated Ireland by ravaging her churches, sanctuaries, and her shrines. 839, the Norse leader Turgeis led an impressive army into the north of Ireland, conquering Ulster, and founding the harbor-stronghold of Dublin. 843, Norwegians plunder the town of Nantes in western France. They then sailed up the Loire as far as Tours and attacked the whole of France. 844, a group of Danes sailed up the Guadalquivir and attacked Seville. They slaughtered indescriminately and even killed a coterie of aged men who sought refuge in a mosque. The sacrilege outraged the Moors and they gave the sanctuary a new name, Mosque of the Martyrs. 845, The Vikings defile the shrine of Clonmacnoise. Ota, the wife of the Norse leader Turgeis, performed pagan rites on the high altar. Turgeis later took the settlement of Armagh and proclaimed himself king. The Irish later captured him and drowned him in Loch Owel. 845, Vikings threaten Paris and are paid a tribute of bullion worth 7,000 pounds of silver not to attack. 851, Danish Vikings land in Ireland and join forces with the Irish to become the rulers of Ireland. 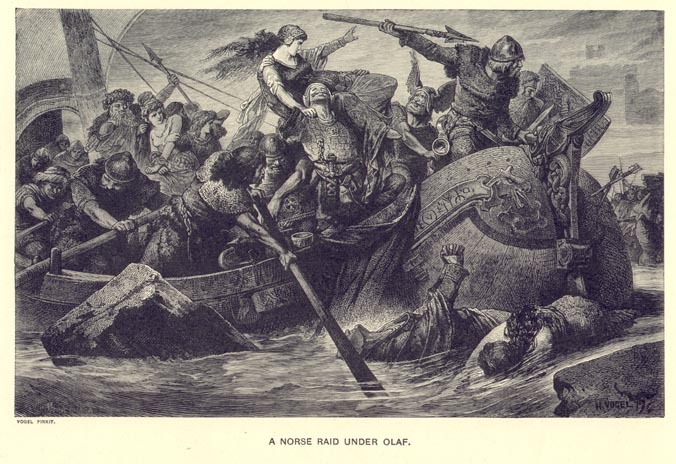 853, Olaf and Ivar, two sons of a minor Norwegian ruler, established a Norse kingdom in Dublin. This kingdom lasted for more than two centuries. 859, the Danish chieftain Hastein joined forces with another Viking leader and led a fleet of 60 dragon ships through the straits of Gibraltar and raided Algeciras and the coasts of Morocco. 860, Hastein led his fleet to Italy and sacked Luna, a town that no longer exists. 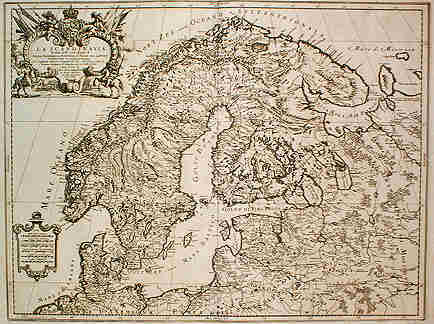 874, first settlement of Iceland. 876, Rolf the Ganger's first arrival in the Seine. 885, birth of Erik Blood-Axe. 907, Swedish Viking Oleg the Wise led an army of eighty thousand men and two thousand ships to Constantinople. Panic-stricken, the Byzantines paid a large tribute and agreed to a commercial treaty. 919, birth of Hacon the Good. 930, Erik Blood-Axe becomes King of Norway on Harold Fairhair's abdication. 931, death of Rolf the Ganger, founder of Normandy. 933, death of Harald Fairhair. 934, Hacon The Good becomes king of Norway. 939, Erik Blood-Axe becomes King of Northumberland. 940, Gorm the Old King of Denmark. 950, death of Erik Blood-Axe at Steinmore in England. 958, Harald Bluetooth becomes King Of Denmark. 961, death of Hacon the Good after the battle on the island of Stord. 968, birth of Olav Trygvason. 982, Viking chief Erik the Red, accused of a cold-blooded murder, is banished from Iceland for three years. He set sail for the west and finds Greenland. 985, death of Harald Bluetooth. Swein Forkbeard becomes King of Denmark. 992, Leif Erikson, the son of Erik the Red, leaves Greenland with thirty-five men in search of another land. He lands on Labrador and becomes the first European to discover America. 995, Olav Trygvason becomes King of Norway. Birth of St Olav. 1000, Olav Trygvason killed at battle of Svold by Swein Forkbeard & Olaf King of Sweden. 1066, Norwegian king Harald Hardrada leads an army to invade England, but is killed at the battle at Stamford Bridge near York. The English king Harold Godwinesson is himself killed three weeks later at the battle of Hastings against William, duke of Normandy who was crowned king of the English on Christmas Day. 1070, Danish king Sven Estridsson arrives in Humber to claim England. King Williams defenses were too strong and he was forced to withdraw in the summer. Home. . History . . Viking Life . . Weapons and Armor . . BERSERKERS . . Ships . . Gods . . Runes. . Books. . Movies and Music . . Funnies. . My Collection . . About This Page . . Links . .